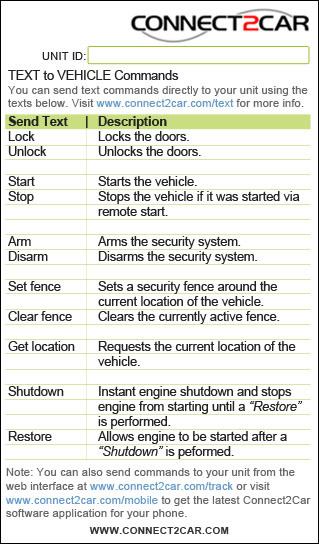 Send text commands directly to your vehicle using any of the texts below. Text commands are NOT case sensitive. All Commands get a confirmation text with an address showing the location where the command was executed. For a pocket reminder for how to control your vehicle via text commands, download the Text Control Card. Note: Text “menu” at anytime to get a list of Text Commands. stop Stops the vehicle if it was started by remote start. arm Arms the security system. disarm Disarms the security system. set fence Sets a security fence around the current location of the vehicle. clear fence Clears the currently active security fence. where is Requests the current location of the vehicle. shutdown Instant engine shutdown and stops engine from starting until a “restore” is performed. restore Allows engine to be started after a “shutdown” is performed.